Boxcutters, Jigger, Citrus Juicer, Strainer, Flûte. 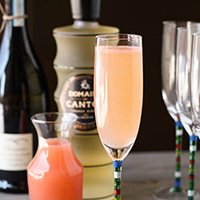 Pour the Juice and Liqueur into a champagne Flûte. Top with Prosecco.